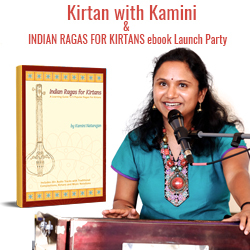 SIMI VALLEY, Calif. - April 21, 2017 - PRLog -- On, Saturday April 22nd, 2017 at 7:00 PM, Kamini Music is hosting a Kirtan Music and Ebook launch party in Simi Valley, CA. Kirtan is a call and response style of music often used with Yoga and Meditation. It includes ancient chants and Mantras that are repeated. This community event will feature together some amazing world musicians playing Celtic Harp, Cello, Indian Tabla Drums, Harmonium, Guitars and Saxophone. Musicians will play several Call and Response style of Kirtans with Classical Indian Raga melodies. Guests will enjoy an hearty Vegan Dinner followed by Kirtan Music session. Kamini Music hosts Kirtan music and Meditation events every other month in Simi Valley, CA.